The Tesla Roadster, the world’s only electric supercar, is officially hitting the streets in Australia. 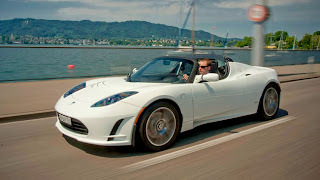 Tesla Motors, its California-based maker, announced that the Roadster is now approved for Australian roads and available for purchase. The hand-built, carbon fiber Roadster is the only car that delivers supercar performance with zero tailpipe emissions. Powered by a liquid-cooled battery pack, the Roadster delivers 215 kW (288 hp) and 400 Nm of instant torque. It accelerates from 0-100 km in less than four seconds and consumes no fuel. The Roadster plugs into any conventional electrical socket and can travel over 360 kms on a single charge. It is the only sports car in the world that can be charged with solar, hydro and wind energy. The Roadster 2.5 is Tesla’s fourth iteration of the Roadster in just two years, reflecting Tesla's commitment to innovation and its tight feedback loop with its engineers and customers. The 2.5 includes improvements to interior comfort, power control hardware that enables spirited driving in hot climates, and an optional 18-cm touch-screen display with navigation and back-up camera. Pricing for the Roadster 2.5 starts at AUD 206,188 (plus on road costs). One will be on display for the public from 9 a.m. to 6 p.m. on Saturday, Jan. 15 in First Fleet Park at Circular Quay. Tesla is revolutionizing the ownership experience with its house call approach to service. Tesla’s mobile service technicians, the Tesla Rangers, travel to customers’ homes or offices to perform annual inspections, firmware upgrades and other services. This unique program offers Roadster owners unparalleled convenience whether they live in Sydney or Perth. Tesla’s objective to make zero-emission vehicles widely available complements Australia’s long-term commitment to clean energy and transportation, exemplified by the government’s $1.3 billion Green Car Innovation Fund for electric vehicle technology. Tesla Motors has sold more than 1,500 Roadsters to customers in over 30 countries. The company sells cars directly to customers, both online and through its growing network of global showrooms, which will soon include Sydney. This is great! Even if i can't afford it, it'll be great to see Roadsters around town.